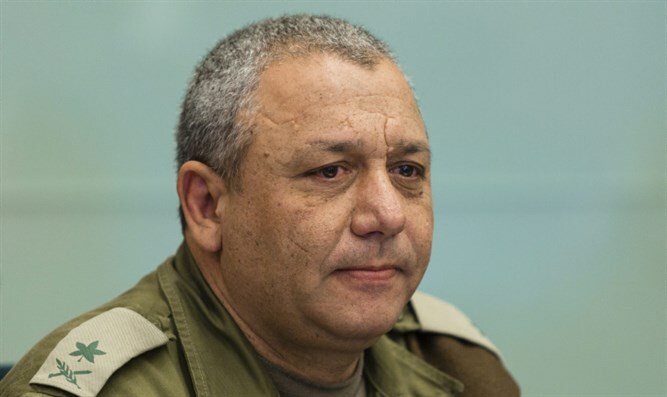 IDF Chief of Staff Gadi Eizenkot gave a rare interview Thursday to Elaph, a Saudi newspaper based in London, in which he called for a new regional coalition to counter Iran's growing influence and threats in the Middle East. "The State of Israel is now in its best position militarily," Eizenkot said at the beginning of the interview. "We have developed a lot, we have the military force, the intelligence, the air force, the infantry that is in the best condition, We are therefore greatly appreciated by the moderate countries in the region." "Regarding the challenges," the chief of staff noted, "in the past the threat was armies of countries such as the Syrian army, and so forth. Today, there are areas of explosive tensions such as Hezbollah in Lebanon, the West Bank, Gaza Strip, Sinai, and Syria. Local events can cause a wide-ranging strategic confrontation." However, Eizenkot stressed, "The real and greatest threat in the region is Iran, which there are three important factors that need to be acted upon. The first is the nuclear program, which has been temporarily frozen, but there is no doubt about Iran's intentions to achieve nuclear capabilities. Secondly, Iran's imposing its influence on various regions and supplying arms [to proxies] to carry out missions, such as to Hezbollah, the Houthis, and Islamic Jihad." He continued: "At the same time, there is an American policy to establish alliances to fight Daesh (ISIS), and they succeeded in doing so. The US is also trying to strengthen and support the moderate Sunni axis in the region without putting its soldiers on the ground to fight. On the other hand, there is a Russian policy that looks only at the Russian interests in Syria. They have made a pact with Assad, Iran and Hezbollah on the one hand, and with the Americans to fight against Daesh, and with Turkey and ourselves (Israel) as part of a mechanism to prevent friction, which has been working very well." Eizenkot said in response to the question of what Iran thinks of Israel: "One can see the Iranian plan to control the Middle East through two Shi'ite crescents: The first from Iran through Iraq to Syria and Lebanon. The second, through the Gulf from Bahrain to Yemen to the Red Sea. This must be prevented from happening to this region. There is hope in the statements and speech of US President Trump in which he stated that there is a need to prevent the Iranian missile program and its establishment in Syria and Iraq. I see this as a hope for the region. There is complete agreement between us and Saudi Arabia, which has never been an enemy or fought against us, and we have never fought against it. I think there is full agreement between us and them regarding the Iranian axis." "I participated in a meeting of chiefs of staff in Washington and when I heard what the Saudi representative said, I found that he fully matched what I think about Iran and the need to deal with it in the region and the need to stop its expansion program," Eizenkot said. "There is an opportunity with President Trump to form a new international coalition In the region, a large and comprehensive strategic plan must be implemented to stop the Iranian threat. We are ready to exchange information with the moderate Arab countries, including intelligence information and to deal with Iran." Eizenkot was further asked, "Have you shared information with Saudi Arabia lately?" "We are ready to share information if necessary, and there are many common interests between us and them," he said.